Have you ever found parsnip germination to be temperamental? I’ve tried sowing them from early February through to May and the most successful germination has taken place once the temperatures have warmed up, around April and in particular, when I’ve sown them directly on top of multi-purpose compost in my vegetable beds. This year I’ve delayed sowing everything until now (April) as it’s either been too wet or recently, too cold. We’re still not out of the woods in terms of temperatures but I’m taking a gamble and hoping the weather forecasts are correct and that the days, and in particular the nights, should be warming up soon. 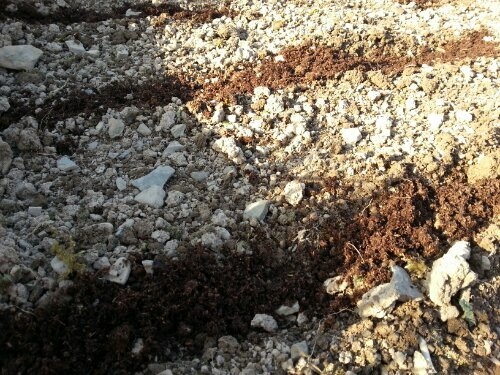 If they don’t I’ll cover the bed with horticulture fleece to protect the newly sown seeds or seedlings a bit more. It’s worth remembering that unlike most other vegetables, parsnip seeds do not have a long shelf life – it’s best to replace them every year. You can see from the top picture how stony our soil is and no matter how often we pick stones, they still keep coming back! 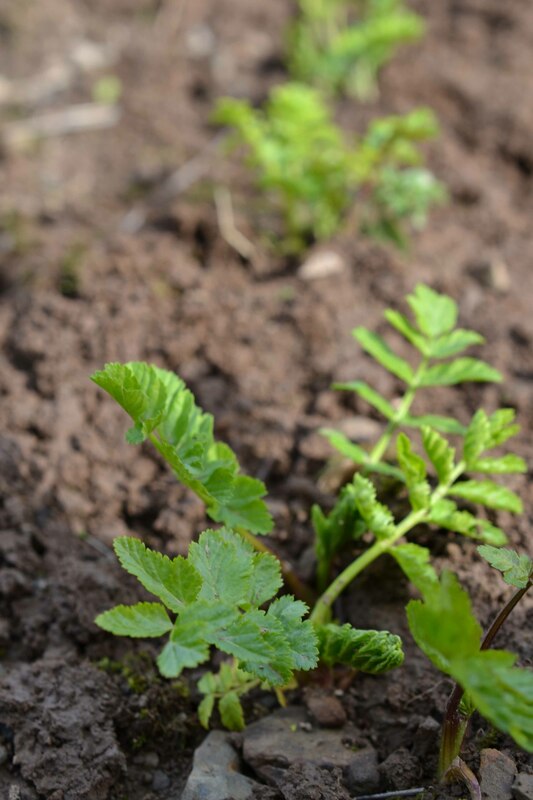 We also have a heavy clay soil and all the books tell us that we shouldn’t grow carrots or parsnips in either soil type, but every year we do and every year they grow (so it’s always worth trying everything out and seeing for yourself). Okay so they’re not award-winning monsters but they are tasty! My quick tip for successful parsnip germination is: Line the cool clay shallow drill with a layer of multi-purpose compost, sow the parsnip seeds approx 2 cm deep then cover them with another layer of compost before finally covering them over with a thin layer of top soil and watering. Then patiently wait to see the little parsnip shoots appear. Germination can take as long as three weeks so don’t despair if nothing happens for a while. 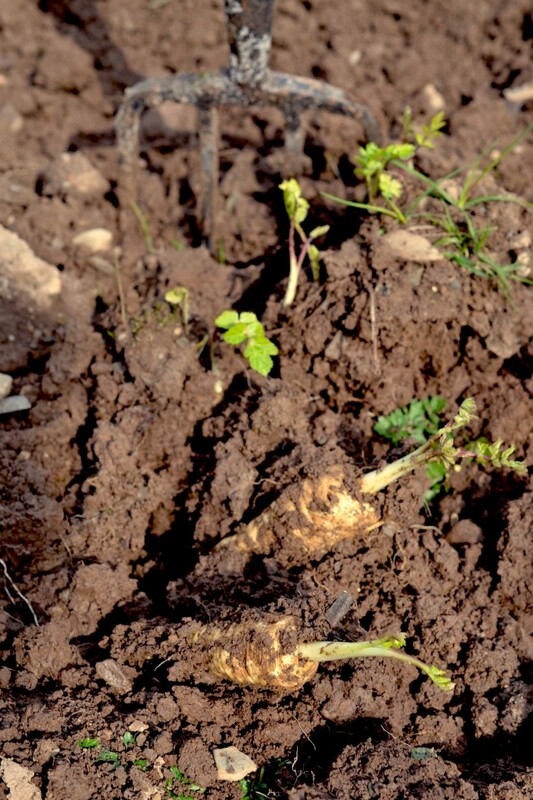 Have you ever had problems growing parsnips? It’s the long wait to find out if they germinate, so I found a tip….pre chit the parsnip seeds on damp kitchen paper in a takeaway carton and cover with another sheet of damp kitchen paper. Keep inside in a warm room and after approx 1 or 2 weeks you will see little white shoot coming out of the seeds. These will definitely grow ! I did this and planted them and all little white shoots grew.Disgard the ones that don’t have white shoots! That’s an excellent tip Cath, thanks for sharing! I still have a few more rows to sow given that I’m hoping to make wine from them next year so will start some off indoors and see how they compare. Choosing flowers & planting spuds. A day in the life of a community garden.